Sixteen samples of miscellaneous furniture fragments consisting of small decayed fragments found in Tumulus P were used for these studies, which were conducted at the University of Minnesota. Each piece was divided in two, and half was used for consolidation and the other half left untreated. Varying concentrations of Butvar B-98 in 60:40 ethanol and toluene were used to consolidate the samples. Consolidation was carried out either by soaking the samples in solution or using a combination of soaking and application of vacuum pressure. In the first instance, the sample was lowered into solution and allowed to slowly absorb consolidant until sinking. The sample was left in the consolidant for 24 hours, drained, and then wrapped in polyethylene. In the second instance, the sample was lowered slowly into solution, and a vacuum was pulled in 5 cm (Hg) increments to 20 cm (Hg). The sample was left in solution under vacuum for half an hour, and then the pressure was released. When the sample had been immersed in the solution for a total of 24 hours, it was removed, drained, and then wrapped in polyethylene. After consolidation and drying, samples were prepared for scanning electron microscopy using previously described techniques (Blanchette and Simpson 1992). Furniture samples were identified microscopically to be boxwood. This wood in a sound condition has thick-walled fibers and small-diameter vessel elements (fig. 4). The untreated samples of furniture examined had cells that were severely decayed (fig. 5). Most of the fiber cells were eroded with only a fragile, thin cell wall remaining. 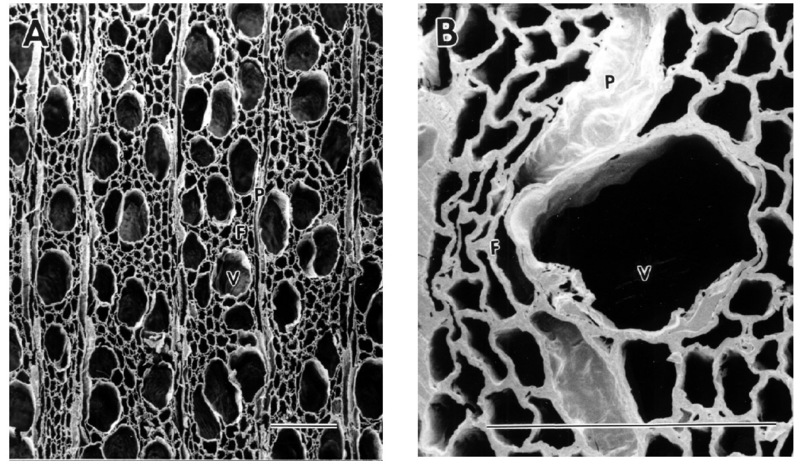 In a few cells, distinct cavities were observed within the fiber secondary wall, indicating that a soft-rot form of fungal attack had caused the decay. The decay had progressed to such an advanced stage that the entire secondary wall was destroyed in most cells. This type of decay had been identified and characterized previously from the wooden tomb chamber and coffin found in Tumulus MM (Blanchette and Simpson 1992; Blanchette 1998). The attack on the secondary wall region of the fibers removed the entire thick-walled region, leaving only a thin framework of middle lamella. The strength properties of this decayed wood were greatly compromised as compared to the strength of sound boxwood. In some samples, the decayed cells were distorted and had collapsed. Many adjacent cells were compressed together, while cracks and voids in the cell structure were observed in other regions. stabilized the wood. Thus, increased strength and stability were imparted to the decayed wood without significant changes to the wood microstructure. The distribution of the consolidant was visible only after microscopic examination. 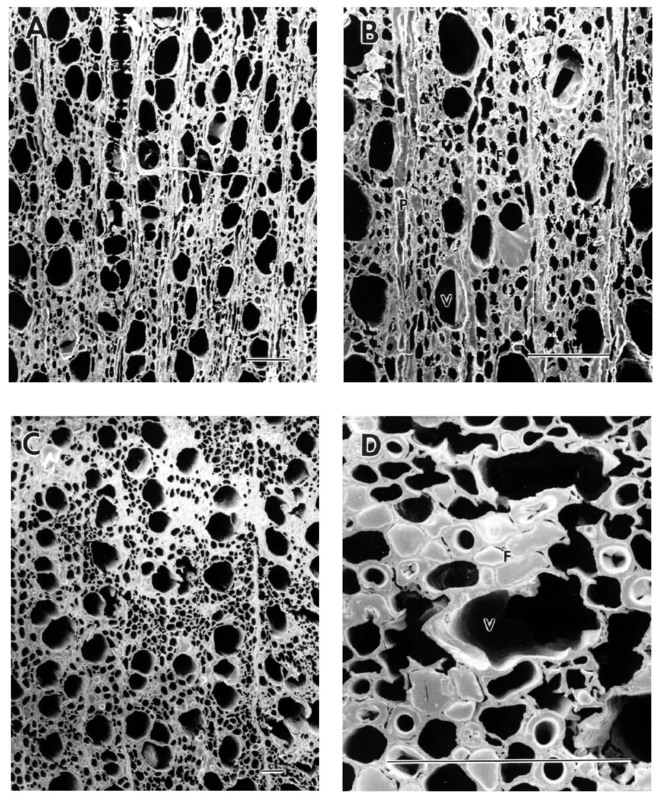 In samples of decayed wood with cells that had been crushed and compressed, the consolidant was found to have accumulated in the small-diameter spaces between crushed cells (fig. 7a). Greater numbers of cells were occluded with the consolidant than in other decayed wood samples where the morphological structure of the wood had been preserved. 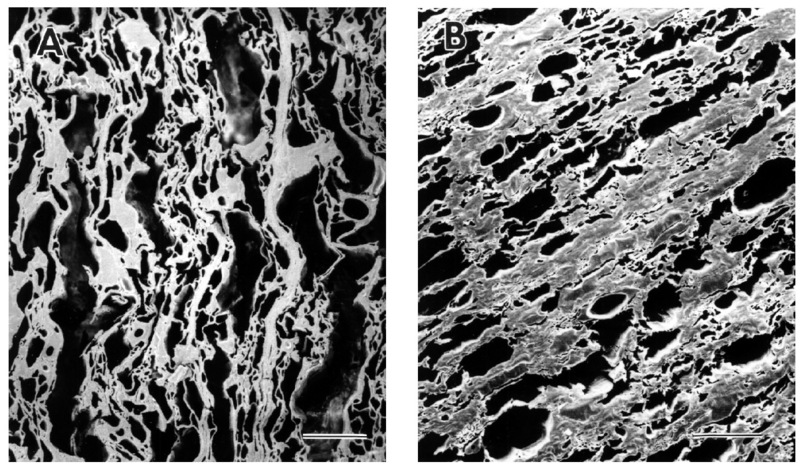 Severely decayed wood samples treated with a 12.5% Butvar B-98 solution had even greater amounts of consolidant evident within the crushed and collapsed wood cells (fig. 7b). In some samples where the integrity of the wood had been so greatly compromised that cracks or voids caused it to be in jeopardy of fragmenting into minute pieces, increased concentrations of consolidant provided greater binding and increased strength. 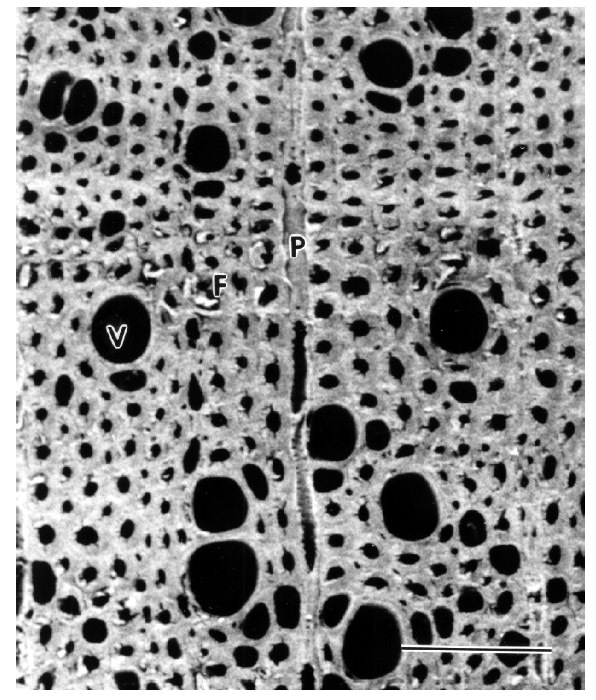 The increased amounts of consolidant were visible within the crushed lumina of the fibers, but due to slightly larger pore size, the vessel elements usually did not become totally occluded. The results of the study demonstrate that treatment of decayed archaeological wood with 10% Butvar B-98 solution can be carried out without significantly altering the micromorphological structure of the wood. At relatively high magnifications with microscopic observations, the consolidant can be seen to coat the cell walls and fill some of the lumina of small diameter cells. This type of treatment greatly aids the stability of the decayed wood without significant changes to the microstructure.